Norfolk : creeks, boats and harbours. – Dirty wet dog , boats and sailing. 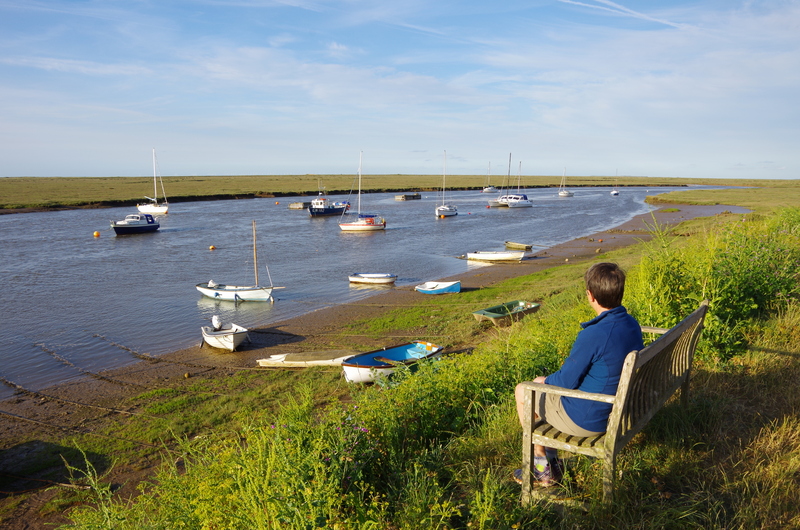 Norfolk : creeks, boats and harbours. It might be obvious but we really enjoyed our few days inNorfolk, Ok so the weather was kind and the light was great but the creeks and marshes were fascinating as they changed through the day and over the tides. It was great to see a part of coast without bland same-y marinas and identical plastic boats like for example we saw as we drove past the end of Portsmouth harbour the next day. As far as boats went that we could see and remember we weren’t seeing it from the deck of a boat but just like any other land-bound tourist the boats all tended to the small side and nearly everything that we did see afloat or on the sand seemed to fit the place well. Many of the houses were absolutely beautiful and very individual compared to the bland and uniform boxes we drove past endlessly the next day in Essex-shire…..i guess the comparison is that the Norfolk coast looks and feels expensive and has the kind of shops with too much ‘E’ as in ‘lifestylE and aspirational lifestylE magazines. I suspect that a lot of houses here are expensive second homes and that there isn’t much work here except for some farming, the seasonal tourist trade and a few active fishermen so there is probably very little in the way of affordable housing even if what is here is good to look at. Excusing some mild cynicism on my part though and i hope that some of my photographs do the place justice so for this one i am just going to shut up and let the pictures do the talking. I came back with more than a hundred pictures of this part of the Norfolk coast so this will almost just be a short photo essay of the small area between Burnam and cley. Blakeney, just upstream of the quay which was underwater when we got there. The main channel into Wells harbour with an English registered Bojer on the sand and i think a double-ended Hillyard this side . The Bojer looked very much at home with its boards up and i do like that curved short-gaff rig. On the quay : the kind of lifeboats that we used to refit in my boatyard days with a Drascombe and a Devon Yawl in the foreground : Drascombes seem very popular boats in the area and i imagine them to be almost like ‘MPV’ boats here. The main creek at Wells, the yacht in the foreground is i think the Cornish Crabber 22 which looks like it would be a good boat for this coast. Just about every boat here is either a lifting keel or centerboarder, bilge keeled or one of the simpler multihulls. The only fin keeled boats that i definitely saw were alongside the pontoon in the river. Further up the creek i got down to sea level mainly to look for the wild edibles which are common here : plants like sea purslane and marsh samphire, i think the multihull here is a modified Wharram . Nice looking flint-faced cottages at Wells. Cley : Windmill and cottages. I definitely want to go back there some time, naturally i would want to have a boat there so that i could get right out into it all : i can’t help but re-visit the idea of having a stable cruising dinghy or dayboat that would tow easily and could be slipped into any of these creeks and harbours but that would also be enough boat to handle the bars and a bit of coastal sailing in between the harbours. Stephen Mundane wrote : ” As I said previously, great photos. And as for your cynicism, I reckon it’s well founded. I visited the North Norfolk coast a couple of years ago for the first time since childhood and, once you get away from the caravan sites and into he villages, it does seem to be all Cath Kidston retro polka dots, organic runner beans and the holidaying Fabian upper-middle class in their second-homes. Still worth a visit though. I really feel that i have to rein-in my natural cynicism in the blog and it really came to the foreground in Norfolk. Wells struck me as being very much the same now as it was when i went there in the 70’s except that a few of the shops are now a bit more upmarket bit the chippy still does excellent fresh fish n chips right on the harbourfront and everyone that i saw there seemed to be enjoying themselves , whether dipping lines for crabs, running about on the beach…and i saw one bloke of around my age un self-consciously building a sandcastle with his kids to families just walking around it all looked just like the kind of things i enjoyed doing and i guess i still do. The place and i mean the ‘natural’ place ie the marshes, creeks, dunes and beaches all have a lot to offer…just very different from where i live down in the south-west. Peter Cash Wrote : “What a pleasure to share in your travels. As a young guy 50+ years ago, did my first real adventures in a new Holt Pacer at Blakeney. Best sailing area for me ever, beats even the Baja, 1000 lslands and the lintracoastal/Chesapeake. Outer Banks in NC are the only place to come close, although my memories are likely clouded by time and an aging body. A new dinghy, Healey 3000 and the choice blond girlfriend, life was never better in the 60’s. I was just searching for secondhand wayfarers………..hmmm. Peter Cash wrote : “Of course the Blakeney harbour web cam is in my favs along with you site, Wells not so much. Guess l must of been a uppity young snot. Oddly enough was very briefly a Snottie in the Merchant. I mistakenly thought at 16, blue/gold and a white cap got the girls, turned out the MG and Healey did. Thanks so much for the recharge of my memories. Wells just might be the first place and the first time that i ever went camping properly on a school trip : we had a physics teacher called Joe Rigby who was a tough and straight-talking yorkshireman (scared the willy’s out of me) who liked to take his older pupils on camping trips and i think the Wells trip was the first one i ever went on. I remember the campsite which is now depressingly ALL caravans, the shellfish stand (i am sadly allergic) and what we called the ‘gunge’ shop (rock, fudge and sweets). Although we did lots of ‘look at that’ ‘roll-eyes’ at some of the morbidly obese tourists wadlling from pub to chippy there was still a real sense of everyone having simple seaside fun and long may that be the case. Previous A short camp interlude. As I said previously, great photos. And as for your cynicism, I reckon it’s well founded. I visited the North Norfolk coast a couple of years ago for the first time since childhood and, once you get away from the caravan sites and into he villages, it does seem to be all Cath Kidston retro polka dots, organic runner beans and the holidaying Fabian upper-middle class in their second-homes. Still worth a visit though. What a pleasure to share in your travels. As a young guy 50+ years ago, did my first real adventures in a new Holt Pacer at Blakeney. Best sailing area for me ever, beats even the Baja, 1000 lslands and the lintracoastal/Chesapeake. Outer Banks in NC are the only place to come close, although my memories are likely clouded by time and an aging body. A new dinghy, Healey 3000 and the choice blond girlfriend, life was never better in the 60’s. Of course the Blakeney harbour web cam is in my favs along with you site, Wells not so much. Guess l must of been a uppity young snot. Oddly enough was very briefly a Snottie in the Merchant. I mistakenly thought at 16, blue/gold and a white cap got the girls, turned out the MG and Healey did. Thanks so much for the recharge of my memories.